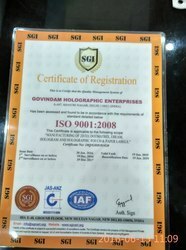 Incepted in the year 2012, Govindam Holographic Enterprises, established its name in the market, as one of the leading manufacturers, traders and suppliers of this impeccable and wide range of Holographic Product. The range widely used in the baking and telecom industry, is made up of the finest Two D & Three D Hologram, Colour Hologram and Flip-Flop Hologram. Its making involves the utilization of the finest raw materials and modern machines in compliance with the set industry norms and guidelines. This ensures the product’s standard of quality. Further, the offered range is known to be marked at the most reasonable rate possible. The highly advanced state-of-the-art infrastructural facility at Govindam Holographic Enterprises, undergoes up-gradation on a highly regular basis. The facility laced with all the necessary machinery and equipment, helps us in the attainment of several of the firm’s predefined targets. The facility, in order to manage the firm’s operations, in the best possible manner, has been parted into a number of highly operational units. These units, in the most efficient and effective manner, helps us maximize productivity. Further, the abidance of industry ethics, have helped us generate a huge client base. Under the able guidance of Mr. C. S. Sharma and Mr. Chandara Kant Sharma, we have managed to reach several heights of success in just 2 years of our existence. His ability to understand the market and make commendable decisions, have been nothing less than an asset to us. Our highly skilled and experienced team of professionals helps us in the attainment of several of the firm’s predefined goals and objectives. These professionals are recruited on the basis of their ability and willingness to perform. For reasons of attaining smoother and effective management of the team’s operations, the professionals have been divided into a number of highly operational units. The partitioning is done on the basis of the professional’s proficiency in a specific vocation. To us, quality is something of high importance. Thus we engage in the utilization of high grade raw materials and modern machines, in compliance with the set industry norms and guidelines, utilizing the finest raw materials and modern machines. This ensures the product’s design and finishing. Further, the range is known to be sent for several highly stringent quality examinations, where all manufacturing defects are eliminated with high level of precision. Being a client centric firm, we do the hard work to offer our clients ultimate level of satisfaction. Our team members work in close-coordination with the customers in order to attain their high level of satisfaction. As an organization, we completely understand the expectations and needs of the customers and thus we always come up with excellent quality every time. Our features like transparent transactions, easy modes of payment, efficient transport system, ethical business policies and close-synchronization are highly appreciated by our clients. The highly advanced state-of-the-art infrastructural facility at Govindam Holographic Enterprises, has been parted into a number of highly operational units, based on their skills and experiences. For reasons of attaining smoother and effective management of the firm’s operations, the facility has been parted into several highly operational units. These units, with highly level of effectiveness, help us maximize productivity. Further, the facility is regularly upgraded, to maintain our pace in the market. We are known to be amongst the leading manufacturers and suppliers of this commendable and diverse range of Holographic Product. To maintain this reputation, we engage in the utilization of the finest raw materials and modern machines, in compliance with the set industry norms and guidelines. This ensures the product’s standard of quality. Further, the offered range is marked at the most reasonable rate possible and is delivered in the most punctual manner.